Shortly after British Prime Minister Neville Chamberlain and French Premier Édouard Dala­dier con­firmed for them­selves the Ger­man inva­sion of Poland on Septem­ber 1, the two leaders gave the order for gene­ral mobi­li­za­tion and evacu­a­tion of chil­dren and mothers from their main cities. 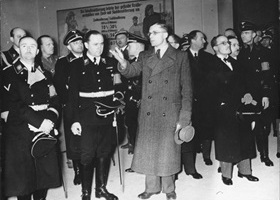 Both leaders also pre­pared to coor­di­nate the deliv­ery in Berlin of notes demanding Ger­man aggres­sion against Poland be stopped and Ger­man troops promptly with­drawn. If the Ger­mans could not pro­vide assur­ance of that hap­pening (there was no dead­line), the British note concluded that the British govern­ment would fulfill its obliga­tion under the terms of the Anglo-Polish mili­tary pact con­cluded the month before. 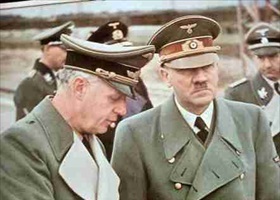 The British and French notes were handed to Adolf Hitler’s foreign minister, Joachim von Rib­ben­trop, late on the 1st. Reading the notes Hitler could not deter­mine if they were for­mal ulti­ma­tums or not. But on this date in 1939 Hitler had decided that if the notes were ulti­ma­tums, he would have nothing to do with the idea—hastily floated in seve­ral Euro­pean capi­tals, but mainly in Rome—of holding a peace con­fer­ence. (Hitler said as much to Benito Mus­so­lini the next day, adding that no con­fer­ence was possible that devalued the “blood sacri­fice” already made by Ger­man soldiers.) Near 8 p.m. on Septem­ber 2, Cham­ber­lain found the British House of Com­mons in an anx­ious and truc­u­lent mood partly due to the ab­sence of a dead­line that might com­pel Ger­man forces to leave Poland. He sensed that his govern­ment would col­lapse the next day with­out an early dead­line for Ger­man with­drawal. Dala­dier, on the other hand, speaking to the French Cham­ber of Depu­ties, received a standing ova­tion when he ticked off French efforts to save the peace and the neces­sity of honoring the West’s pledges to Poland. (Cham­ber­lain could have shared with Mem­bers of Parlia­ment simil­ar exam­ples of the West’s efforts and pledges of sup­port, but his speech was ill-pre­pared, unin­spiring, very short (four minutes), and late in a very long day; hence, the angry mood of some MPs.) Near mid­night London and Paris fines­sed paral­lel ulti­ma­tums, to be delivered in Berlin at 9 a.m., Septem­ber 3, to expire later that day. Ger­many was to with­draw its troops from Poland imme­di­ately or a state of war would exist between the three nations. Right: Berlin’s diplomatic community thought Ribben­trop a “bump­tious” (Coulon­dre’s words) person. Coulon­dre and Sir Nevile Hen­der­son, Britain’s ambas­sa­dor to Berlin, remarked on Rib­be­ntrop’s snub­bing them in their dealings with the Ger­man Foreign Office. Both diplo­mats much pre­fer­red working with Rib­ben­trop’s deputy, State Secre­tary Baron Ernst von Weiz­saecker, an ex-naval officer and the father of future Ger­man Presi­dent Richard von Weiz­saecker (in office 1984–1994).